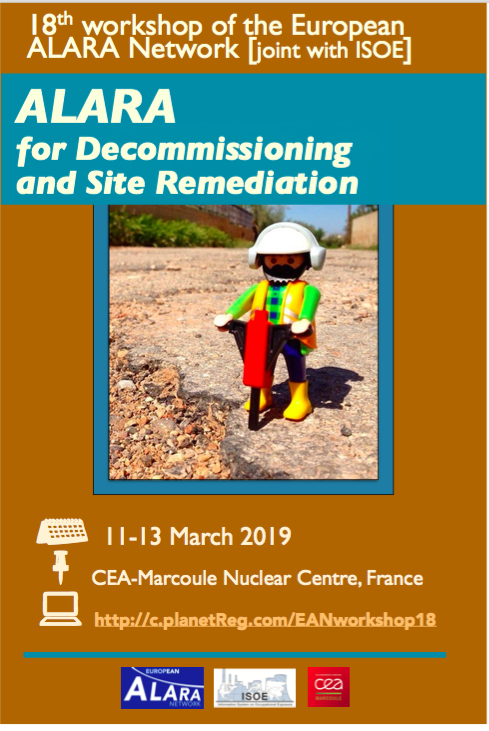 "ALARA in Decommissioning and Site Remediation"
The participants (ICSM Marcoule, 11th March 2019). standards regarding radiation protection for decommissioning and site remediation; both in the nuclear and the non-nuclear sectors. To examine the conceptual and the practical aspects of the optimisation (ALARA) principle in these fields for workers and the public. 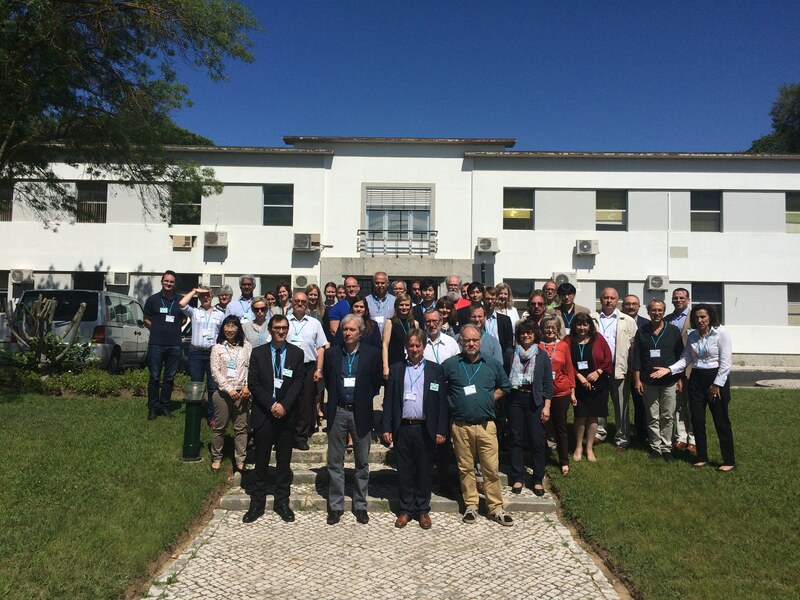 The workshop aims at gathering a large array of experience and feedback from work performed in nuclear installations, installations outside the nuclear fuel cycle (ex. research facilities) and legacy sites. 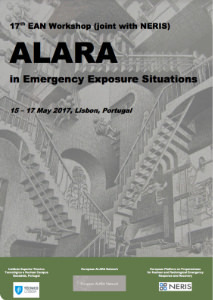 To discuss and investigate selected key themes and overriding issues with regard to ALARA; to identify remaining needs and perspectives. 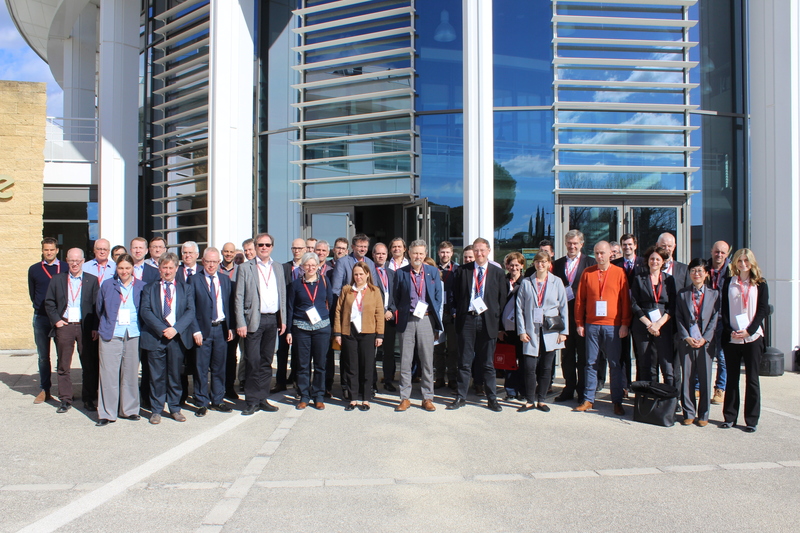 The workshop was jointly organized with the ISOE Working Group on Decommissioning (WG-DECOM). The final programme is available here. As part of the programme, time was devoted for discussions in working groups between participants. A technical visit of Marcoule installations was organized. Report from Working Group 1a - How to apply the ALARA principle for workers for decommissioning and site remediation? Report from Working Group 1b - How to apply the ALARA principle for workers for decommissioning and site remediation? Report from Working Group 3 - The holistic approach: how to be ALARA in the context of other risks? Report from Working Group 4 - The challenges raised by waste and how to overcome? Management of Radon Risk in Pays de Montbéliard Agglomération in France, S. Lafage, T. Schneider, I. Netillard. Implementation of the National Radon Control Strategy for Ireland: Year 2 of the Strategy (April 2015 - June 2016), D. Fenton. A Survey on the Cosmic Radiation Exposure of Aircraft Crew in Europe between 2008 and 2015, S. Andresz. Continuing EAN Survey on Radiation Protection Practices in Dental Radiography. EAN activities : Preliminary programme of EAN 17th Workshop available. 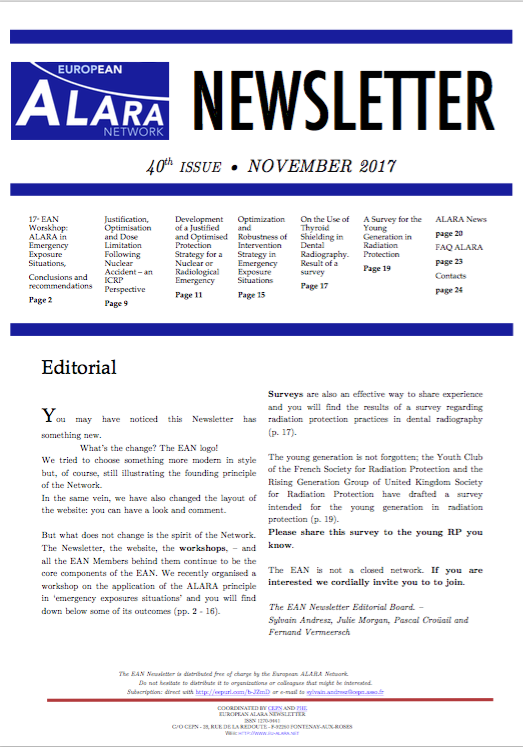 As always : ALARA News and FAQ ALARA. 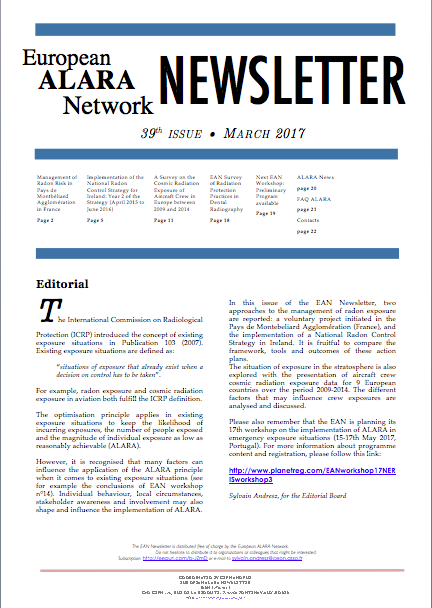 ENETRAP III-Implications for Industrial Radiography? Please note that EANNORM Network has designed a new website. You may want to have a look at www.ean-norm.eu and explore it! 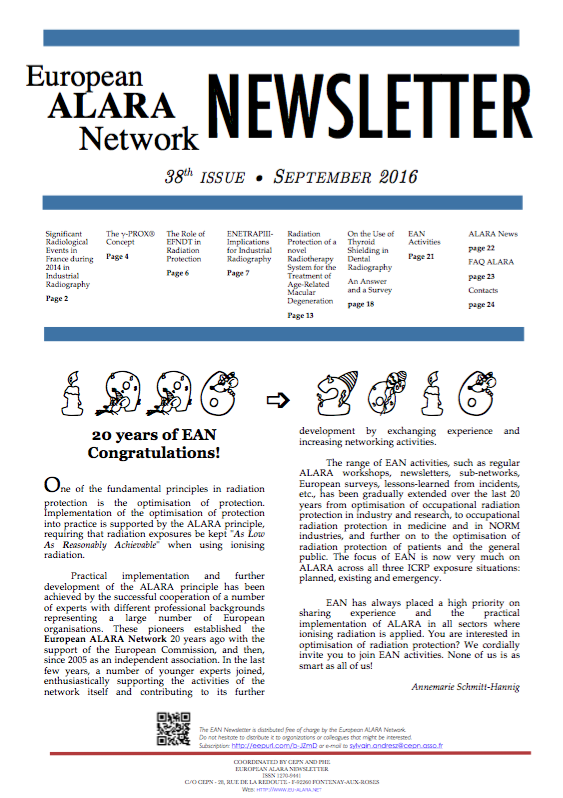 The Strategic Agenda of the European ALARA Network for the 2015 - 2020 period has been elaborated by the Members in 2014 and is now published on the website (in the 'Presentation of EAN/EAN Strategic Plan' section). 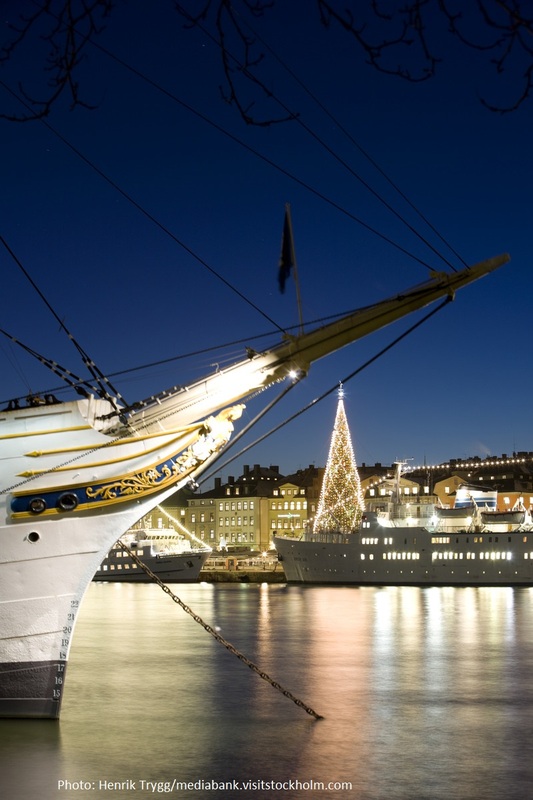 The Strategic Agenda reminds the general objectives of EAN and presents the objectives of the Network for the period and the work programme to fulfil it.